ruthdelacruz | Travel and Lifestyle Blog : Welcoming 2009! Certified Belle De Jour! Welcoming 2009! Certified Belle De Jour! Wishing everyone a better year for 2009! Our family always celebrates and welcomes new year in a quiet way, and this year, I only have my mom, dad and I. I get used to the idea of just having dinner, praying and waiting for the clock to strike twelve; and be thankful that it would be a quiet morning for our family. We decided to just have a simple dinner last night. What's the point of cooking and making yourself tired in the kitchen when there are just three people in the house? Besides, we always get to cook every meal or dish we want anytime of the year. Sometimes I wish I were a part of a bigger family.. (actually, ours is a big family, it just so happen that my siblings are in different parts of geography). Tonight, we just feast our eyes on fireworks displays (and I took alot of videos, haha). I cannot believe the people in our place, they still can afford fireworks and firecrackers. And I mean every house here, except ours. We dont want to risk our lives and (body parts) for cheap big bangs. I just hope this would be a better year for me and my family. The best blessings we have received last year are good health and safety; and I wish these would still be on top list this year amongst the other many blessings which were given to us that we never really asked for. The only thing that excites me for this year is my new planner! Tadah!!! 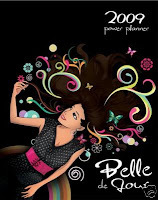 I got a Belle De Jour Planner, and I just sooo love it! Last year, I missed a copy of this planner so for this year, as early as October when they announced that they are getting pre-orders for this planner, I immediately reserved and paid for one! But ladies no need to worry, for I know for 2009, the makers produced alot of copies for this craze. You can get one at Powerbooks, and even from resellers in Multiply. The prints and materials are so nice, and sections include menstrual tracker, expense tracker, vacation planner, to-do lists, and articles about wellness, health, fashion, etc.. It seems as if I am reading Cosmo. A real two-thumbs up for the makers of this planner! What's the bomb is that it comes with so many coupons from nice stores and restos. The discounts and the freebies are worth ten times its price ($11.96). As early as January 2008, I know I'll have Belle De Jour for this year. This planner is making a lot of good raves and waves from ladies in Manila, that should give Starbucks some worries on its promo (the Starbucks planner for 2009 is not that impressive by the way.. better buy a generic planner from your local bookstore, or rely on your company's giveaways OR GET A BELLE DE JOUR PLANNER!). And yes, I have a lot of friends who I converted to be Bellas! This planner is just so fab that now I am worried, this planner might give me reason less posts for this blog huh? © ruthdelacruz | Travel and Lifestyle Blog : Welcoming 2009! Certified Belle De Jour!